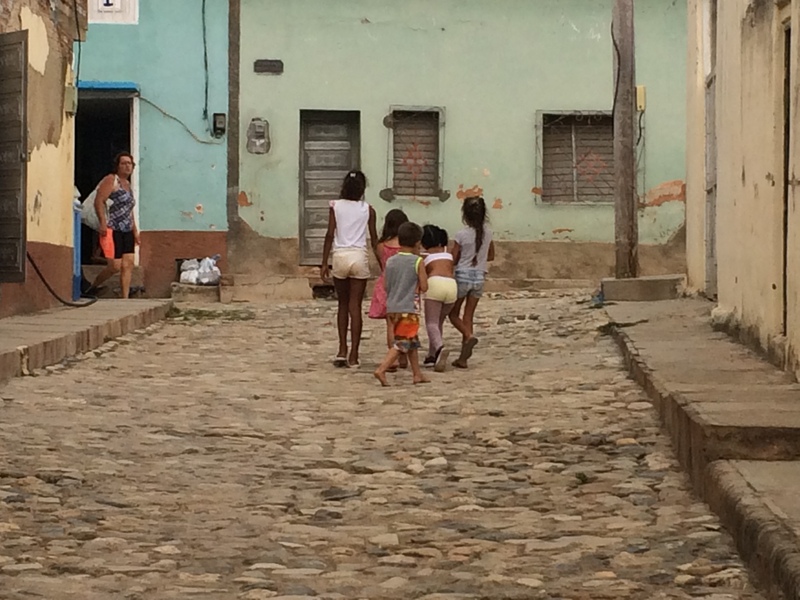 A common sight in Trinidad, Cuba is groups of children playing in the streets, running barefooted through the barrios unattended. While it may be easy to jump to the conclusion that their parents should be paying closer attention, the reality is that here in Cuba, kids have a kind of freedom that has been lost in most of the modern world. The streets are safe for them. The biggest threat they have is cutting their foot or stubbing their toes on the cobblestone. The primary reason for this kind of safety in the streets is that there are eyes everywhere. The way the community is set up, very few things go unseen and the kind of deviancy we have in a closed community where everything can happen behind closed doors, does not exist here. The houses, the windows, the doors, the streets are all open to each other, and always there are people outside taking part in life, conversing and connecting, and everyone keeps an eye out for the kids and animals. Cubans operate as an extended family in their neighborhoods. Typically the kids are within ears range of a big strong “OYE” from a family member, but even when they are not, there is such a strong community and family mindset here that children have an incredible amount of freedom and safety in that freedom. Obviously an unarmed public, and a host of other factors are part of their security, and this is NOT to say that things don’t happen here, but as a rule, the streets are very very safe for the youth to enjoy, play and feel free in their neighborhoods with or without mom and dad looking over their shoulder.